In addition to meeting cost and sustainability goals, CMU was used for ALL Its Worth, contributing to the innovative exterior aesthetic, interior structure, visually-rich interior aesthetic and acoustic performance. The cost effective nature and considerable possibilities of the interior strategy inspired a similar material application for the exterior wall design, establishing locally-produced CMU with recycled content as an important design element. 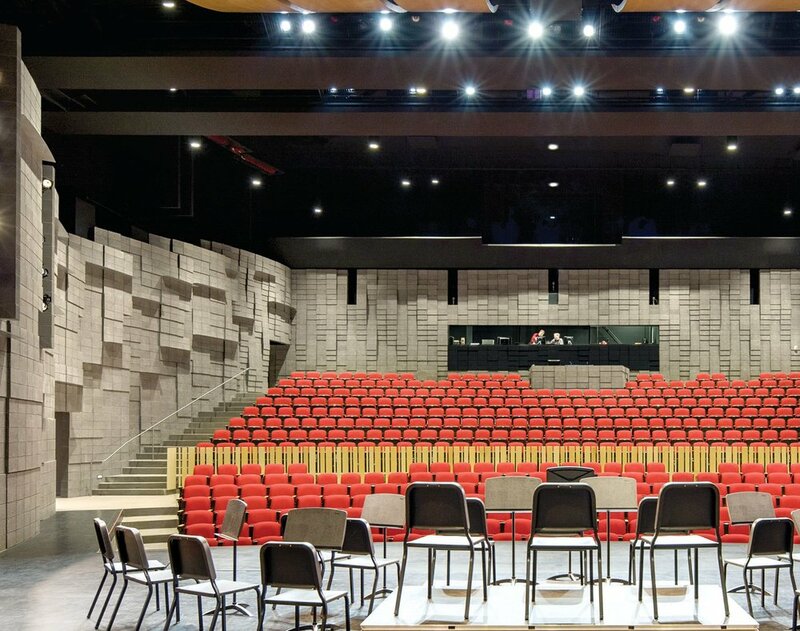 The interior acoustic shell of the performance hall has many jobs to accomplish: sound distribution, interior structure, durable finish and visually-rich aesthetic. The hard and dense nature of solid-grouted masonry provides an excellent surface for sound reflection. According to senior acoustic consultant and project manager at McKay Conant Hoover, William Chu noted “CMU provides the mass and stiffness required to achieve the warmth of sound associated with low frequency reverberation time.” Side walls are scalloped by a series of convex curves designed to spray sound waves evenly across the space. Contrasting with the exterior detailing, interior walls feature a stacked bond – also with an offset coursing detail of 5/8'' from the unit below. Surface variation allows for creation of bumps that aid in even sound distribution. Closest to the stage, bumps are largest for stronger early sound reflection improving clarity. Along side walls, they change from a module of five CMU wide by five CMU tall, down to a single 8x8x16 offset unit for small bumps in the rear for more diffuse reflections to enhance sound envelopment. Adjustable heavy curtains provide additional acoustical variation. Using musical structure was conceptual inspiration for the architecture. North and east walls of the new performance hall are arranged in running bond and sloped 2° of the horizon. This is achieved by cutting the stem courses of masonry at the footing. This marquee wall is also folded by an offset coursing detail that slopes each block a maximum of 5/8'' off center from the one below. Line of the fold ascends diagonally across the north elevation and has no offset. As the wall splays out in either direction, the offset goes from 0 to 5/8'', creating the fold. Inspiration for this expressive masonry composition is derived from the opening clarinet glissando of George Gershwin’s Rhapsody in Blue. Image of a spectrogram display plotting frequency against time, with sound pressure as brightness was abstracted into the formal resolution of this wall. Grey 8x8x16 CMU changes to a charcoal colored unit at this diagonal and as the two tones blend together, the ascending line culminates with the marquee sign. Mesa County Community College liked the prominent piece of land occupied by an empty movie theater located at the SE corner of campus, visible and easily accessible from the 12-lane freeway for the new home of its music department and performing arts center. 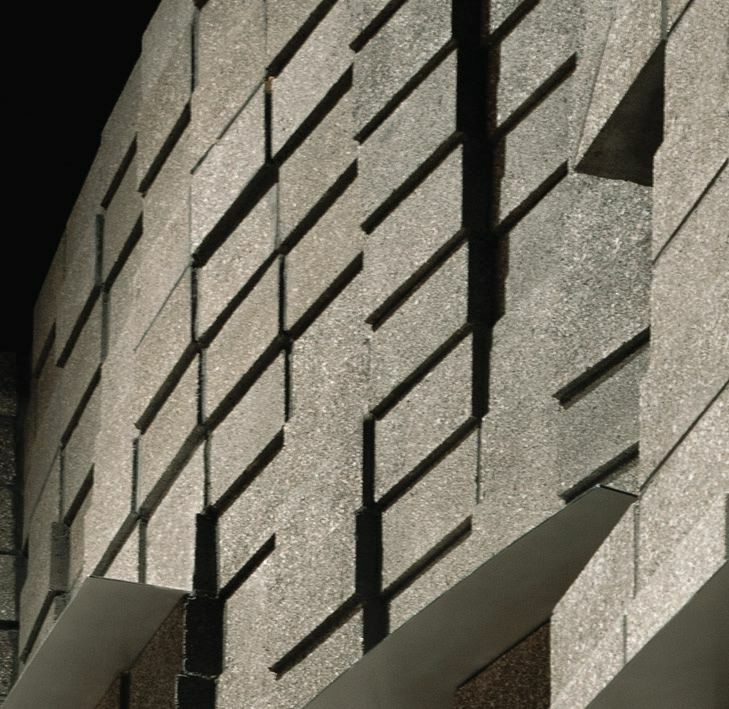 Incorporating the existing concrete masonry unit (CMU) building was an important piece to meeting the College’s environmentally-sustainable directive. While not large enough to accommodate all of the programmatic space needs, the 24,500 sf of existing building houses performance classrooms, back-of-the-house program spaces and the entry courtyard area. Additional 19,500 sf is new construction. The general contractor was added to the team early in the process so that materials, systems and ideas could be tested against cost for feasibility. The idea of utilizing intrinsic material characteristics of CMU for the main performance hall’s interior proved valuable as a local mason contractor embraced the unusual geometries proposed. 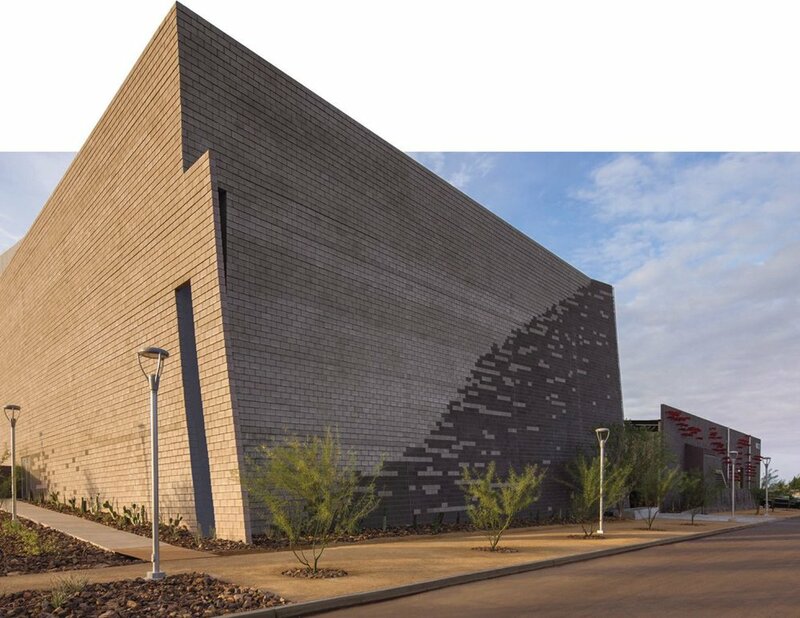 Mesa Community College’s PAC provides the department’s faculty and staff with an architecture that physically embodies their inspiration and passions. Great use of CMU. It embodies the visual, acoustical and sustainability. I appreciate so many of the goals set for this project, strived for with design excellence. The simple use of the pixilation, the two colors of CMU and attention to the color of the mortar make the large façade of one material, playful, scaled down and interesting. Folding the masonry wall and leaning the form take away from the monolithic and heavy feel of the CMU, allowing it to feel playful and light. Masonry unit allows for these types of folded geometries to be achieved. The project goes on to use the CMU as an interior finish in a highly sensitive acoustic area with a lot of figuring and as a surface to accept patterning. This material is used in a variety of manners showcasing its possibilities. George Gershwin’s Rhapsody in Blue was inspiration for the masonry design. An offset coursing detail slopes the wall, as if it were swaying to the music.